This end unit, 2 bedroom, 2-bath, Turnberry Village townhouse has undergone an "extreme makeover". 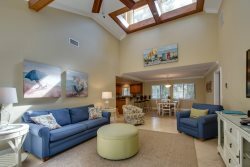 From the outside clapboards, to the kitchen, the experts have completed their work in time for the Hilton Head summer season, and have achieved the perfect mix of classic, contemporary, chic, and comfortable. The ground level entry foyer set the mood of the the seashore motif, as soon as you enter and proceed up the six steps to the great room. The kitchen, with its updated granite countertops and new appliances, also features refinished cabinetry, an open dining counter with two barstools, and an alcove with a full-size washer and dryer. 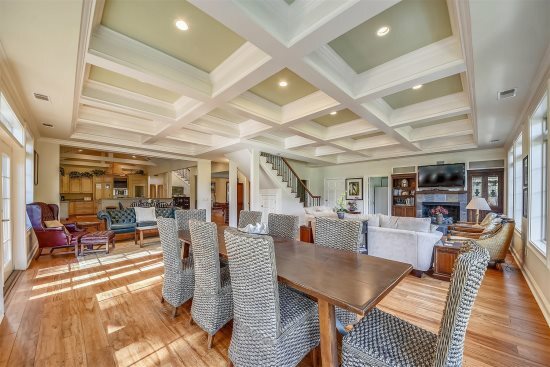 The adjacent formal dining area has a stylish table and chairs for six, a large window with a golf course view, and shares a cathedral ceiling with the living room, which is a spacious area with comfortable furnishings, a Flat screen TV/VCR/DVD, and a slider door to the deck. The deck is partially covered and has an outdoor dining table for four. Also on this level are a full bath and the master bedroom, which has a king-size bed, a Flat screen TV, a walk-in closet, a large sunny window, and a connecting door to the hall bath. An open, two-story stairwell, with windows on both sides, leads up to a spacious, cathedral ceiling loft area, which overlooks the living room and is furnished with two full beds. In addition, the second floor features a full bath and a guest bedroom, with a queen-size bed, a Flat screen TV, and a connecting door to the bathroom. 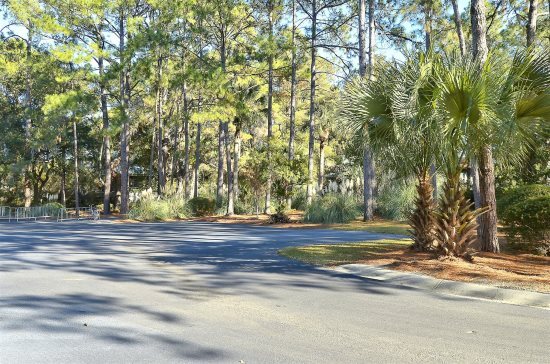 The Turnberry Village area of Palmetto Dunes Resort has an on-site pool that is open April through September, views of the Fazio golf course, and a short bike ride or walk to the beach.All beach distances are measured from the center of the complex. Your team is a joy to deal with and always has been. We have rented from you for 16 years and have recommended your agency to many. Especially people with dogs. We really enjoy the Turnberry area, lots of area to walk with our dog when the beach is not an option. We also find it quiet and peaceful. Easy to work with website and team. WE started renting from Sunset in 2002 and have always found the members of your team to be courteous and easy to work with. When something goes wrong at the villa, someone is there to quickly fix it, or arrange to have someone come in to deal with the repair. We enjoy staying in Turnbeeey 231 and have done so for the past 10 years or so. We find the villa to be bright and cheery. We very much appreciate the owners making the villa dog friendly. We find the area around the villa to be convenient for walking our dog on the rare occasion where we do not take him to the beach. The area is very well lite at night, again to our benefit with a pet. Always a seamless, efficient process! Enjoyed the stay immensely...everything was clean and ready for me when I arrived. over all the staff is helpfull and friendly. We only talked on the phone with you all, but everyone was very nice to us and answered all our questions! We really enjoyed our stay in this property (and so did our dog)! Very happy with our villa. Enough room for our family to spread out when we came back from the beach. This villa is so peaceful. A lovely view of the golf course in a nice, quiet setting. The back deck overlooking the golf course was extremely pleasant--we ate nearly every breakfast and lunch out there and enjoyed the birds tremendously. The large roof overhang is very handy for drizzly weather. The most excellant condo I've ever rented. Made what I thought was going to be the worst vacation ever (in North Myrtle Beach) one of the best ever. THanks so much for your help in finding us a place at the last minute.